Seljuq sultan of Rûm Kayqubad I conquered Alaiye (Alanya) and formed a naval arsenal there. Alanya became the homeport of the Seljuk fleet in the Mediterranean Sea. Kayqubad I later formed a fleet in the Black Sea based in Sinope (Sinop), which, under the command of Amir Chupan, conquered parts of the Crimean peninsula and Sugdak on the Sea of Azov (1220–1237). According to Kâtip Çelebi a typical Ottoman fleet in the mid-17th century consisted of 46 vessels (40 galleys and 6 maona's) whose crew was 15,800 men, roughly two-thirds (10,500) were oarsmen, and the remainder (5,300) fighters. Ottoman fleet anchored at the French port of Toulon in 1543. Miniature by Matrakçı Nasuh, who was travelling with the fleet. Starting from the conquest of Syria in 1516, the Ottoman fleet of Selim I started expanding the Ottoman territories towards the Levant and the Mediterranean coasts of North Africa. Between 1516 and 1517 Algeria was conquered from Spain by the forces of Oruç Reis, who declared his allegiance to the Ottoman Empire, which was followed by the conquest of Egypt and the end of the Mameluke Empire in 1517. 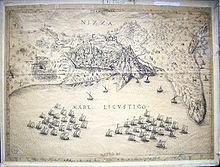 In 1522 the strategic island of Rhodes, then the seat of the Knights of St. John, was conquered by the naval fleet of Kurtoğlu Muslihiddin Reis; Suleiman I let the Knights leave the island, and they relocated their base first to Sicily and later to Malta. In 1527 the Ottoman fleet participated in the conquest of Dalmatia, Croatia, Slavonia, and Bosnia. In 1529 the Ottoman fleet under Salih Reis and Aydın Reis destroyed the Spanish fleet of Rodrigo Portundo near the Isle of Formentera. This was followed by the first conquest of Tunisia from Spain and the reconquest of Morea by the forces of Hayreddin Barbarossa, whose fleet later conquered the islands belonging to the Duchy of Naxos in 1537. Afterwards, the Ottoman fleet laid siege on the Venetian island of Corfu, and landed on the coasts of Calabria and Apulia, which forced the Republic of Venice and Habsburg Spain ruled by Charles V to ask the Pope to create a Holy League consisting of Spain, the Republic of Venice, the Republic of Genoa, the Papal States and the Knights of Malta. The joint fleet was commanded by Charles V's leading admiral, Andrea Doria. The Holy League and the Ottoman fleet under the command of Hayreddin Barbarossa met in September 1538 at the Battle of Preveza, which is often considered the greatest Turkish naval victory in history. 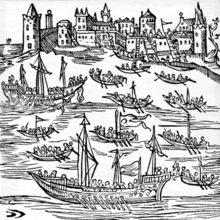 In 1543 the Ottoman fleet participated with French forces in the Siege of Nice, which at the time was part of the Duchy of Savoy. Afterwards, Francis I of France enabled the Ottoman fleet to overwinter in the French harbor of Toulon. This unique Ottoman wintering in Toulon (sometimes inaccurately called an occupation; the Ottomans merely stayed the winter and did not impose any form of governance on the populace) allowed the Ottomans to attack Habsburg Spanish and Italian ports (enemies of France); they left Toulon in May 1544. Matrakçı Nasuh, a 16th-century Ottoman Janissary, polymath, and swordmaster, reportedly participated in the wintering in Toulon. In 1541, 1544, 1552 and 1555, the Spanish-Italian fleet of Charles V under the command of Andrea Doria was defeated in Algiers, Naples, Ponza, and Piombino, respectively. The Ottoman Navy also engaged in blockades of Georgia's western coast during the sixteenth and seventeenth centuries in order to coerce local kingdoms into submission. An Ottoman galleon in the 18th century. The 19th century saw further decline in Ottoman naval power, despite occasional recovery. Following the defeat against the combined British-French-Russian fleet at the Battle of Navarino in 1827, Sultan Mahmud II gave priority to develop a strong and modern Ottoman naval force. The first steam ships of the Ottoman Navy were acquired in 1828. In 1829 the world's largest warship for many years, the 201 x 56 kadem (1 kadem = 37.887 cm) or 76.15 m × 21.22 m (249.8 ft × 69.6 ft) ship of the line Mahmudiye, which had 128 cannons on 3 decks and carried 1,280 sailors on board, was built for the Ottoman Navy at the Imperial Arsenal on the Golden Horn in Constantinople. Following the Young Turk Revolution in 1908, the Committee of Union and Progress which effectively took control of the country sought to develop a strong Ottoman naval force. The poor condition of the fleet became evident during the Ottoman Naval Parade of 1910, and the Ottoman Navy Foundation was established[by whom?] in order to purchase new ships through public donations. Those who made donations received different types of medals according to the size of their contributions. In the aftermath of the Balkan Wars, the Ottomans remained engaged in a dispute over the sovereignty of the North Aegean islands with Greece. A naval race ensued in 1913–1914, with the Ottoman government ordering large dreadnought battleships like Sultan Osman-ı Evvel and Reşadiye with the aforementioned public donations made to the Ottoman Navy Foundation. Although Istanbul had made full payment for both battleships and sent a Turkish delegation to Britain to collect them after the completion of their sea trials, the United Kingdom confiscated them at the outbreak of the First World War in August 1914 and renamed them as HMS Agincourt and HMS Erin. This caused considerable ill-feeling towards Britain among the Ottoman public, and the German Empire took advantage of the situation when the battlecruiser SMS Goeben and light cruiser SMS Breslau arrived at the Dardanelles and entered service in the Ottoman Navy as Yavuz Sultan Selim and Midilli, respectively. These events significantly contributed to the Porte's decision to enter the First World War on the side of the Central Powers. However, Germany and the Ottomans had already signed a secret alliance, the Ottoman-German alliance on 2 August 1914, before the British naval seizures. In 1915 at the Battle of Gallipoli, the British, French and ANZAC fleets failed to pass through the Dardanelles Strait (Çanakkale Boğazı) thanks to the heavy Turkish fortifications lining the Strait, mining by Turkish minelayers like Nusret, and fierce fighting by the Turkish soldiers on land, sea and air. [page needed] During the battle, the British submarine HMS E11 sank Barbaros Hayreddin on 8 August 1915. ^ Peter Malcolm Holt, Ann K. S. Lambton, Bernard Lewis The Cambridge history of Islam 1977. ^ a b c d e Turkish Navy Official Website: "Atlantik'te Türk Denizciliği"
^ Konstam, Angus (2008). Piracy: the complete history. Osprey Publishing. p. 91. ISBN 978-1-84603-240-0. Retrieved 15 April 2011. ^ Grazebrook, Lieutenant, "The Ottoman Navy"
^ Description d'Ukranie, qui sont plusieurs provinces du Royaume de Pologne. Contenues depuis les confins de la Moscovie, insques aux limites de la Transilvanie. Ensemble leurs moeurs, façons de viures, et de faire la Guerre. Par le Sieur de Beauplan. — A Rouen, Chez Jacques Cailloue, 1660. ^ kadem, which translates as "foot", is often misinterpreted as equivalent in length to one imperial foot, hence the wrongly converted dimensions of "201 x 56 ft, or 62 x 17 m" in some sources. Melis, Nicola, "The importance of Hormuz for Luso-Ottoman Gulf-centred policies in the 16th century: Some observations based on contemporary sources", in R. Loureiro-D. Couto (eds. ), Revisiting Hormuz – Portuguese Interactions in the Persian Gulf Region in the Early Modern Period (Wiesbaden, Harrassowitz, 2008, 107–120 (Maritime Asia, 19).